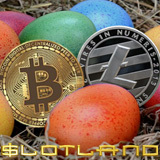 This Easter at Slotland, you have a choice of Easter casino bonuses, especially if you are using cryptocurrency for your deposits such as, Bitcoins or Litecoins. Like Bitcoins, Litecoins can be purchased through most major cryptocurrency exchanges including Okex and Kraken. Further information is available on Slotland's website: https://www.slotland.eu/en/litecoin. In addition to a cryptocurrency deposit bonus, Slotland is also offering a choice of deposit bonuses with different wagering requirements for the holiday weekend. There's also an Easter bonus if you play video poker. "Since we began accepting Bitcoins last fall they've been really popular with players," said Slotland manager Michael Hilary. "So we decided to give the option of another cryptocurrency and have just started using Litecoins as well. They work just like Bitcoins but transactions are quicker and fees are less." Wagering requirement: 22X. Valid for slots, Keno and progressive jackpot games. Wagering requirement: 18X. Valid for All American, Aces & Eights, Deuces & Joker Wild, Double Bonus Poker, Jacks or Better, Joker Wild, Tens or Better video poker games. Wagering requirement 30X. Valid for slots, Keno and progressive jackpot games. All Easter casino bonuses available March 30th – April 2nd, 2018 only. Slotland has been entertaining players all over the world for more than 20 years. The one-of-a-kind casino now has more than 60 unique casino games.